How the Condors Started | Ultimate Frisbee History in U.S. 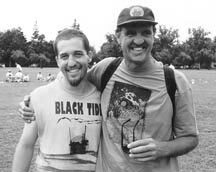 This article is written to convey the beginnings of the Santa Barbara Condors Ultimate Frisbee team and, to a minor degree, west coast Ultimate. Realistically I am not able to separate the beginnings of the Santa Barbara Condors and my own roots of involvement in competitive frisbee sports. What prompted me to write was a request from a former teammate, who played later in the Condors’ history, for a bit of background for a local tournament newsletter he is putting together. It turned into a project that allowed me to capture my involvement with the Condors and the sport of Ultimate. This is more than Dan asked for, but it allows me to reflect on a special time in my life. Subsequent to the formation of the Santa Barbara Condors I was also involved with the formation of the Ultimate Players Association and its beginnings are also covered here. My hope is that this article allows the reader to better understand the relevance and timing of certain events. TK at 1997 Collegiate Nationals at U.C. Davis (with Jason Seidler) watching the Black Tide win the National Championship. The Wham-O company first introduced Frisbees to their product line in the middle 1950s. To address the growing number of Frisbee enthusiast Wham-O, under the direction of Ed Headrick, started the International Frisbee Association in 1967. I do not address the history of Ultimate Frisbee. Ultimate was developed by Columbia High School students in Maplewood New Jersey in the late 1960’s. I was not present nor involved in frisbee sports during that time and the scope of my awareness concerning this time is limited to contact in later years with Irv Kalb, Dan Roddick and, to a limited extent, Larry Schindel. I know that many individuals made significant early contributions to furthering the sport of Ultimate and although they may not be mentioned, I mean them no disrespect whatsoever. If the reader is interested in the history of Ultimate, there are at least two good sources for that information. The article titled, “The History of Ultimate Frisbee” written by Larry Schindel and Paul J. Schindel in 1977 and edited by Edward D. Summers, is probably the definitive history. The authors were Columbia High School students during the time the game was being developed. The second source is a 1990 paper, “Ultimate: Columbia High School and Beyond” written by Eric Halpern also a Columbia High School student, twenty years after the game was developed. My path toward becoming deeply involved began innocently enough in a park on a Sunday afternoon late 1973 when I asked a stranger holding a Frisbee if he wanted to toss it around. That stranger turned out to be my life long friend and frisbee partner Tom Shepherd. This event took place at Palm Park in Santa Barbara, California. Palm Park is a flat, lawned area directly adjacent to the beach near the Santa Barbara pier. The park is an especially beautiful place to play both because of its picturesque setting and a steady flow of unimpeded wind. For those reasons alone it is still a very popular spot among freestylists. However, when we first began meeting there to play, an added attraction for us was the music which was played as an accompaniment to a group of folk dancers who also gathered at the park every Sunday. Tom and I soon formed a relationship revolving around weekly Sunday meetings at Palm Park. We soon began to increase how often we played and included the Mission Lawn as one of our regular playing venues. With the beautiful ocean vistas, large rolling lawn and location adjacent to the historic Santa Barbara Mission it is a natural place to play frisbee. The first Frisbee Tom and I played with was an All American model. As new Frisbee models were introduced into the marketplace, we would try them. We tried the first yellow fastbacks for a short time but when the Super Pro model became available it became our Frisbee of choice. Our involvement in frisbee was further expanded when we joined two of Tom’s friends on a trip down to the Rose Bowl in Pasadena, California in August of 1974. His friends, budding professional film makers, had arranged to shoot some footage of the first World Frisbee Championships. Although we were not participants, we followed the film crew right down onto the fields where we saw many skilled Frisbee throwers up close. I remember being wide-eyed and overjoyed to find that so many kindred spirits shared our love of flight and the frisbee. That day we were also witnesses to a demonstration game of a team field sport called “The Frisbee Game” also known as “Netbee.” Though the team sport of Ultimate was well known to the people at Wham-O in 1974, they chose to stage a demonstration of a different team sport at the Rose Bowl in August of that year. The game had two teams playing each other as in Ultimate, however the object of the game was to throw a Frisbee into a net guarded by a goalie, similar to soccer. After we returned to Santa Barbara, I called Wham-O, the sponsor of the Rose Bowl event, to inquire about our interest in future participation. I was told that it was an invitation only event and that in order to be invited one must first pass a demanding skills test known as the World Class Masters test. They gave us the phone number of Tom Boda, a long time player in southern California, who could administer the test. We subsequently drove to Laguna Beach and both succeeded in passing on our first try. Upon completion of the test we were sent a postcard officially inviting us to the 1975 World Frisbee Championships to be held in August at the Rose Bowl. Wow… we were excited! The sequence which brought us to this point was not lost on many of our friends who by now shared more regularly in some of our frisbee throwing sessions. Bolstered by the invitation to participate, we stepped up our throwing schedule and included an even wider circle of friends. It was at one of these group throwing sessions in the spring of 1975 that about ten of our friends were gathered on the Mission Lawn. We were basically just throwing, running and catching when we came up with the idea to figure out a team game we could all play. Collectively we had many good athletes with extensive backgrounds in traditional ball sports. We started out by putting down markers (shirts and shoes) to define the four corners of a field. We basically started out playing football with a Frisbee, trying to score goals on long bombs but soon altered the game by eliminating huddles which slowed down play. We tried several variations and were prevented from continuing only because of darkness. As we were leaving, I remember how excited we were by what we had created, and we decided to try and recruit more people to join us. We agreed to meet the following week at Santa Barbara High School football field where the playing surface would be flat, unlike the slightly sloped Mission lawn. Looking back now, it was on that day on the Mission lawn that we formed what was to become the Santa Barbara Condors. Five of the people present on that day were on our first National Championship team two years later: Tom Shepherd, Greg Sharp, Michael Mininni, Jeff Horn, and myself. It was early in this period of our team’s development that we came across an article in Time Magazine that gave us details of the team sport being played on the East coast. We incorporated the rules that made sense to us and we were off and running – literally. I remember, after one of our early playing sessions, realizing just how physically demanding it was to play. As we took a break, everyone was red-faced and puffing from exhaustion. One guy was puking on the sidelines. We soon had recruited enough people to allow for a couple of subs and we were truly hooked; almost everyone who played had fun – BIG FUN. -frisbee golf, and freestyle (competed in with a partner). We arrived at Cal Tech in Pasadena where we were assigned a free dorm room for four days as well as a players’ package which contained all sorts of Frisbee-related items including the brand new set of G series Frisbees. These were like nothing we had ever seen before. The Frisbees were two different sizes but of identical high quality design. They were called World Class Frisbees and one was 119 grams (40 mold) the other 141 grams (50 mold). It was evident to me right away that these new Frisbees, especially the larger 141 gram Frisbee, flew much better than anything we had ever used. Shortly after we arrived, we attended an orientation meeting. The logistics of the tournament were outlined by the International Frisbee Association director Dan (Stork) Roddick. After the meeting I went up and introduced myself to him and in the course of our conversation told him of our Ultimate playing group in Santa Barbara. I also made inquiries about the demonstration Ultimate game and let it be known that I was interested in participating. I was told to check back later to find out if that was possible. I checked back a couple of times only to get a “we’ll see” answer. I found out on Saturday, after having won the Frisbee Golf event, that I would be allowed to play in the East vs. West All Star exhibition Ultimate game. What I didn’t know at the time was that all of the other players had been specially picked and were known as the Ultimate All-American Squad. These were players from existing, established East coast teams who were flown, at Wham-O’s expense, to the Rose Bowl for this demonstration. To my knowledge, I was the only person from the “West” playing on the Western All Star team. During the playing of the game I remember being frustrated at not being passed to again and again in favor of other teammates. The game was played using the newly introduced 141 gram Frisbee which was definitely better but not that different from the Super Pro Model that Tom and I were accustomed to. The other Ultimate players had mixed opinions about its use in that on the East Coast Ultimate was played exclusively with a Master Frisbee. This exhibition game was played using the 5th edition of the rules of Ultimate which incorporated the use of a hot spot in the endzone. If a team scored in the hot spot, it resulted in a 5-point score; if a team scored in the end zone, a 3-point score was awarded. The knowledge and enthusiasm we brought back with us from the Rose Bowl experience brought additional focus and commitment to our Ultimate playing group. We made up practice jerseys (dark blue tank tops) so that when we split up into teams we could easily distinguish one team from the other. We did, in fact, adopt a team name at this time. We called ourselves the Santa Barbara Disc Connection. Our entire focus was on just playing among ourselves though our practices were spirited and competitive. We had in fact not played any other team. The reality was that there were no other teams in our area to play, at least none that we knew of. We increased our playing frequency by playing two days a week, once on the weekend and once on a weekday afternoon. We also moved our playing site to Dwight Murphy field, using the boundaries of the soccer field as our sidelines and incorporated the goal crease as our scoring area. This in effect eliminated endzones and created a hot box for scoring. In August of 1975, another significant thing happened. Dan (Stork) Roddick came to work full time at Wham-O as director of the I.F.A. Prior to coming to Wham-O Dan had been publishing, since 1973, a magazine called Flying Disc Magazine. His new position at Wham-O was fortuitous for the future of the sport of frisbee in general but more importantly, relative to this article, to the sport of Ultimate. Dan was a graduate of Rutgers University where he had starred on the National Championship Ultimate team. His influence on the company’s policy/perception regarding frisbee as an object used for sport was key to its future. Dan implemented many programs which gave the sport of Ultimate the serious consideration it deserved and promoted frisbee sports inside the company as only a true player could. One of the first things Dan did was to combine the I.F.A.-News and Flying Disc Magazine to produce a new publication sponsored by Wham-O called, Frisbee World. In the first Issue he announced the formation of rules’ committees for each of the various frisbee games. The initial I.F.A. Rules Committee Chairman for Ultimate was Larry Schindel. Larry had been helping organize and promote Ultimate since 1970 when he was a student at Columbia High School. This was significant for the sport, in that Larry would be compensated for phone calls and postage by Wham-O. This marked the first time an outside source had helped further the growth of Ultimate. On December 22, 1975, after the formation of the previously mentioned I.F.A. Ultimate rule’s committee, a meeting with fifty-five players representing thirty Eastern, mostly school and some club, teams took place in Maplewood, NJ. The gathering was organized and run by Larry Schindel, I.F.A. Ultimate Rules Committee Chairman. By December of 1975 there were fifty-three known teams. Of that thirty-nine were college teams, and six club teams. Of the teams listed at the time there was only one team west of the Mississippi; that was an unconfirmed team at the city college in Bakersfield, California. We began having regular communications with Dan Roddick both because he was our connection at Wham-O and the I.F.A. but also because he was forming an L. A. Ultimate team. The first time that I can document our team playing another team was in January of 1976 when we traveled to La Canada High School in Los Angeles for a field meet. A field meet (Dan’s creation) was a format where two clubs/teams could compete in six individual events and two team events. We lost every event except Ultimate where we convincingly beat them. Our team continued to play twice a week and to minimize time conflicts, we began a night practice once a week under the lights. We clearly played for the joy of play; however, the prospect of playing other teams did appeal to a large segment of our group. Under Dan Roddick’s influence, Wham-O began sponsoring a series of tournaments throughout the country whereby individual players could qualify for the “World Championships.” These qualifying tournaments were referred to as the North American Series, and Santa Barbara was the site of the first of these tournaments March 13-14, 1976. Putting on the event was alot of work for the few of us in charge but it also furthered our group’s identity and cohesion in that almost everyone assisted in the staging of the event. In the spring of 1976 we began to receive regular correspondence from Larry Schindel, I.F.A. rules committee chairman, regarding rules issues. This was our official start to becoming involved in the National Ultimate scene. During this same time Wham-O made another significant impact on the Frisbee world with the introduction of a third World Class Frisbee. This new Frisbee incorporated the same high quality design of the previously mentioned 119 gram and 141 gram Frisbees, but this new Frisbee was 165 grams (80 mold). As soon as we got our hands on one we began using it for Ultimate. It was an easy transition from the 141 gram (50 mold) we had been using. By the middle of 1976 we had changed our team name to the Condors. The other significant thing for me was an invitation to become one of the official fifteen members of what was now called the Ultimate Frisbee Players Committee, which I accepted. In April of 1976, sixteen college Ultimate teams played for the National Ultimate Championships in New England. We had received an invitation to participate in this National Championships but practical considerations, primarily money, prevented us from making the trip. Of the sixteen teams that did participate, thirteen were from the east coast and three were from Michigan. Rutgers University defeated Hampshire College in the finals to claim the title. This marks the first use of the 6th edition of the rules of Ultimate which introduced limited end zones and the stalling rule. For the first time, the rules of Ultimate were printed by Wham-O with the I.F.A. logo on the cover page. The Master Frisbee was listed as the official disc. In the meantime the L.A. frisbee club gained in strength drawing from the entire Los Angeles area and soon we had a rivalry. The emergence of a quality opponent proved very beneficial to our team. Irv Kalb, who had recently relocated to L.A., was deeply involved in the promotion of the sport since his involvement at Columbia High School, one year after it was introduced. He was also the captain and one of the stars of the current National Champion Rutgers team. Irv along with another recently transplanted Rutgers teammate, Alan Bonopane, joined with Dan Roddick to form a top quality nucleus from which the team could grow. They used a zone defense giving us our first exposure to anything other than man-on-man. This experienced trio gathered the raw talent of the Los Angeles area and formed the Foothill Institute of Frisbee Culture. We played many close games against them following our initial meeting, but we always managed to win. On March 28, 1977, the first issue of The Ultimate Frisbee Newsletter was issued. This was the first national publication dealing exclusively with Ultimate. James Powers Jr., one of the Penn State team founders, was the editor. The operation was based in Philadelphia, and subscriptions were available for $3.00 for three issues. On our local scene we continued to increase our player base by word of mouth giving us many talented players to draw from. Any time we would either host other teams or travel to tournaments we would split into two equal quality teams to compete. This was an interesting time of growth for our team. As we became exposed to more teams, the issue of competitiveness had to be addressed. This was especially true in that the Western Regionals were fast approaching and an opportunity to play an “eastern team” would result for the winner. We openly discussed any issues which affected our team’s play including how often and when to play, team size, and team selection. The biggest question we faced however was, do we send a single best team to competitions or do we continue to spread the wealth by sending two equal teams? It was decided after much discussion followed by a vote by everyone that we would send our best team to the more prestigious competitions and continue to use two equal teams any other times. We developed a comprehensive practice schedule to prepare for the upcoming Western Regionals. On July 9-10, 1977 we traveled to Irvine, California to play in the Western Regional Championships. We did field two teams in the nine team tournament, a stronger team and one made up of those that didn’t make the “A” squad. The winner was to meet the Eastern Champions at the World Frisbee Championships in August for what would be the first true National title. This was the biggest challenge we had faced and our preparation proved fruitful as we beat Foothill Institute of Frisbee Culture in a close final game to take the regional title. We were scheduled to play the Eastern Champion Penn State Team in August and were motivated to represent the West as best we could. Penn State had come through a very competitive Easterns on April 30-May 1 and being a school team didn’t have the opportunity to play together as a team after June. When we did meet in August, the squads were limited to fifteen players, this number dictated by the Wham-O transportation allocation. Before the game I approached the captains of the Penn State team with a proposal to use a 165 gram World Class Frisbee for the game. This was an interesting proposal since the Easterns had been played using a Master Frisbee. Master Frisbees had been used exclusively for the sport of Ultimate since its invention, except on the West coast. The first serious debate regarding choice of Frisbee occurred at the captains meeting of the Easterns that year. The Easterns had made up special Master Frisbees incorporating the same artwork used on the 165 gram (80 mold) used for the Western Regionals. Penn State graciously agreed to use the 165 gram for the entire game. The final score was Condors 32, Penn State 14. Neither Penn State nor we knew what to expect from each other, but once the game started it became evident that there was a significant difference in age and athleticism. Our average age was around 27. Penn State, a college team was probably about 21. The athletic experience represented on our slightly older team was a contributing factor to our lopsided victory. Later that year, at the California State Ultimate Championships in San Jose, we suffered our first loss. The Foothill Institute of Frisbee Culture, after two years of frustration, beat us in the finals. The official splitting of the country into East and West regions had been established with Larry Schindel being in charge of the East (all states east of Kansas) and myself for the West. On April 8-9, 1978 the Western Regionals Ultimate Championships were held in Stanford, California. The sixteen team tournament had representatives from five western states. We again took two teams to the tournament. Our “A” team went 7-0 throughout the round robin competition and beat a Northern Californian team (Northwind) in the semis. This set up another Condors vs. Foothill match up in the finals, which we won 14-10. This again provided us with the opportunity to play an Eastern team as Wham-O was again paying transportation cost for the winner of the Easterns to fly west in August in conjunction with the World Frisbee Championships. The official rules used for Ultimate (7th edition) were again printed by Wham-O and now listed the 165 gram Frisbee as the official disc. The Eastern Ultimate Championships were played on April 28-30 in Amherst, Mass. Regional qualifying tournaments were used to determine the 17 teams (out of more than 225 teams) that would compete in the Eastern Regionals. Cornell narrowly defeated Glassboro in the finals to win the title and a trip west. August 29, 1978 was set for the match up that would produce a National Champion for Ultimate. We played the game at the University of California at Santa Barbara stadium in front of 4,000 spectators. Cornell was a better prepared and significantly tougher opponent than Penn State. After a close first half, Cornell had a lead early in the second half. However, we went on a 10 -3 run to close out the game. All seventeen of our team members either threw or caught a goal as we defeated Cornell 23-17 for our second consecutive National title. By 1978 the Ultimate Frisbee Newsletter had changed names and editors. It was now called the Ultimate Frisbee National Newsletter and Larry Schindel became the editor. Larry was and had been involved with every level of organization and was still the head of Ultimate Frisbee Rules Committee previously called Ultimate Frisbee Players Committee. Larry soon stepped away from involvement with the sport due to work and marriage commitments. The efforts of Larry Schindel over the years were extremely significant. He consistently put his time and energy into promoting and organizing the sport at a time when resources were very limited. Ultimate had experienced dramatic growth. Dan Roddick with his unique foresight, put in motion the beginnings of a truly autonomous Ultimate organization. With his influence and some financial assistance from Wham-O, Dan initiated an effort to create a true players organization for the sport of Ultimate. Five regions were defined and in the Jan./Feb. 1979 issue of Frisbee World (volume 4, number 1), an article outlining this new structure appeared. The five regions would each conduct their own Regional Ultimate Championships with the winning team from each region going to the Nationals, tentatively scheduled for May 28, 1979 in Philadelphia. The regions, as announced in the article were much as they are today with the original Regional Coordinators being: Buz Laughlin-Northeast, Andrea Cummis-Middle Atlantic, Ross Snyder-South, Andy Klein-Central, and myself-West. Although Andy Klein was unable to fulfill the role of central regional coordinator once the organization officially started, he did contribute significantly to the effort. Bruce Johnson took his place as the first Central Regional coordinator. Prior to the publishing of the Frisbee World article, there had been extensive letter writing and phone calling among all of us to get to the point of being able to announce our intentions. Beyond that, an infrastructure from which the organization could grow had to be established. All of this took significant amounts of time and we incorporated the efforts of those active in our respective regions to help. At some point in these proceeding, almost by default, I took over the responsibility for coordinating our efforts by being the communication link between the regional coordinators. After months of effort we had come up with a set of bylaws for a players association, but before we could move forward we needed the approval of the players at large. The annual East Coast Captains’ meeting, which had been in existence since 1974, was the natural choice for a venue in which to accomplish this. The East Coast Captains’ meeting had initially been set up to provide the eastern college captains a place to meet and set up playing schedules for the coming year. It soon evolved to include discussions of all aspects of the sport, especially rules. Because of the deep history of the game in the area and geographical convenience in that region, this meeting was the only practical way to get at large player approval. To that end, I traveled to the East Coast Captains’ meeting in December of 1979 to introduce the bylaws that we proposed as the basis of the new players organization. The players in attendance scrutinized the bylaws and with minor changes accepted them. The Ultimate Players Association was officially formed. Earlier in the year, the Condors had hosted the Western Regionals on April 21-22, 1979 which had a field of sixteen teams from six states. We again went undefeated and beat the Berkeley Ents in the finals 17-9. The other four regions also conducted tournaments to establish a Regional Ultimate champion. These teams traveled to State College Pennsylvania for the first five-region National Ultimate Championships in May of 1979. The regional representatives, three college and two club teams, were: Cornell University-Northeast, Glassboro State-Middle Atlantic, Michigan State-Central, Orlando Fling-South, Condors-West. Each team played the other in a round robin format to produce a Glassboro-Condors final. We had gone undefeated up to this point, however Glassboro prevailed 19-18 to become the 1979 National Champions. In the winter of 1979, the Condors established contact with the University of California at Santa Barbara Recreation Department. Through persistent phone calls we set up a demonstration / workshop to expose the administrative personnel to the sport of Ultimate. Our interest was in establishing Ultimate as a sport that could be offered through the Intramural Department. We were successful, and in the fall of 1980, Ultimate was offered and 32 teams signed up. The program continued to grow, and by the fall of 1981, they had 72 Intramural Ultimate teams. In January of 1984, Greg Sharp and I formed the U.C.S.B. college Ultimate club sport team. We held tryouts and actively coached for the first two seasons. The tradition of excellence of Santa Barbara Ultimate continues. The 1996 U.C.S.B. Black Tide team was the reining National Champions and a continuing credit to the sport. The Ultimate Players Association put out the first U.P.A. newsletter in April of 1980. Since that time the organization has continued to grow. Events that occurred in Ultimate after this time are thoroughly documented in the U.P.A. newsletters. One of the most satisfying accomplishments I was involved with while serving in the U.P.A. was the updating of the rules from the 7th edition to the much more comprehensive 8th edition, but that’s a whole other story. My intention in writing this article was twofold. First, while memories were still retrievable, to document our team’s somewhat unique beginnings. We were an extremely close-knit group and I attribute that as a major contributing factor to our success. Secondly, I wanted to share with the reader the climate surrounding the development of Ultimate that led to the formation of the U.P.A. Wham-O‘s no longer in existence but without their financial support and Dan Roddick‘s perceptive mind and thoughtful actions, the U.P.A. would not be. I want to acknowledge the selfless contribution of time and energy, then and now, of key individuals whose efforts further the sport and the enjoyment experienced by the players. It would be impossible to name everyone. Eric Simon is someone whose consistent contribution over the life span of the game warrants special attention. I have mentioned Dan, Irv, Larry, Eric and I include myself, as people who have loved the game and have wanted for any number of reasons to see it grow and to feel the satisfaction of being highly involved in something so special. I also want to acknowledge the present generation of men and women who organize and facilitate everything from the Nationals, to making sure everyone knows the schedule of the local summer league. A few are still putting out for the many. Ultimate has continued to grow and evolve since its inception in 1968. It is the ëspirit’ of the game that has set it apart from all other sports, and hopefully that will never be lost.